To ensure the pull-out resistance of certain fittings, do not lay the pipe perfectly straight, but rather with some surplus length (slack). In case of short pipes (up to about 10 meters), or in case of installations on pipe bridges (where it might be difficult to leave slack in the pipe), there should be a pull-out protection device such as a fixpoint clamp before and after every fitting. This applies to some of the fittings; depending on the application. 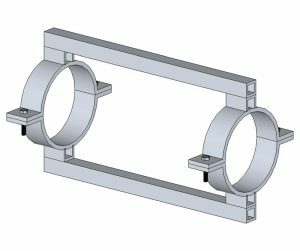 If the pipe is installed in an inclined or a vertical position (for example – in dewatering applications) and common fixpoint clamps cannot be used, the fitting should be protected by a floating fixpoint device such as a fixpoint bridge.